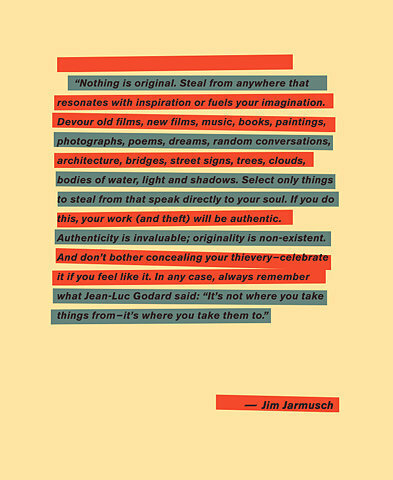 Studio Calico: How Shall We Be Inspired? Well hello good friends! Miss Emily here, thrilled to be hosting the blog today. Today we will discuss various aspects of scraplifting. As Miss Joy mentioned yesterday, there are MANY ways to scraplift someone, but only ONE right way to credit your inspiration. Please, dear ladies, if you do scraplift someone, in ANY way, shape, or form, always give credit to your inspiration. And if luck would have it such, and you do not remember for the very life of you, please say something to the effect of, "I was inspired by someone and cannot for the very life of me remember who that might have been." At least you'd be acknowledging your idea was not your own. Scraplifting is great for trying out new ideas. If you don't feel comfortable sharing your scraplift online without giving credit to your inspiration, keep it to yourself. That's perfectly OK. I submit and do assignments for magazines. Personally, I don't think it's right to submit anything that I've KNOWINGLY lifted a design from. I think elements, techniques, and color schemes are different. 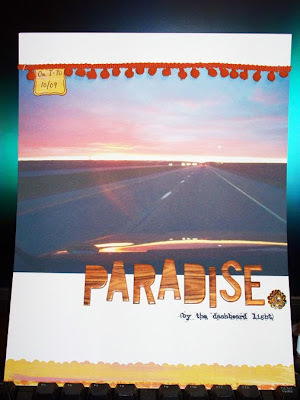 There was one time I had a layout that fit a call exactly and my layout was really different, but I'd gotten the idea from a layout by Shannon Taylor. I emailed her to be sure she wouldn't mind if I submitted. There wasn't an issue, the layout didn't get picked up. I've had others do the same for layouts I did that inspired them. I appreciate knowing this before I see something in a magazine that could have been inspired by my work. I know I didn't come up with the idea, but I appreciate someone acknowledging their work was inspired by me. There's a gray area for sketches, I'm really not sure what the rules are. I talked to Kelly Purkey about this exact thing, she said she was fine if I submitted a layout based on one of her sketches. Asking is always the best policy I believe, especially if you could benefit financially from that inspiration. Always give credit to your inspiration piece. The first piece I ever scraplifted and posted in my gallery at Two Peas I attributed to "a Vicki Boutin." What fun it was to show it to her years later! She got a kick out of it, and I was relieved that I'd credited her way back when! Now I must blush here and admit, I do not have a source for this lovely little piece of artwork. I pulled this off the web prior to my days of crediting correctly. Will you forgive me dear reader? I hope that is the case! To illustrate some of these ways, I asked a few members of Studio Calico to help me out. Our first example comes from the British Isles. AllieH has a lovely minimalist style and it tickled my fancy to ask her to look for a TECHNIQUE to scraplift. She went on the hunt and discovered this layout in the gallery of Donna (dmbd). She admired the color scheme as well as the all the fun little bits that Donna always adds, but in the end, it was the way Donna had cropped her photo in a circle that led Allie to choose that particular technique to lift. Now cropping your photo in a circle is not something Donna made up, but the way she did it on this particular layout spoke to Allie, who was then inspired to do the same technique on her layout, so she's going to give Donna the credit she deserves for the inspiration. Allie comments that she will definitely try new techniques because of this challenge. Thank you Allie for such a lovely example of technique lifting. My next example comes from the wide open plains of the Midwestern United States. I asked Kelly (baylorgrad) if she would lift a specific ELEMENT from another member's layout. 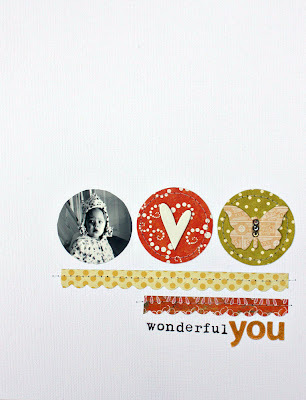 She fell in love with the look of this layout by our own DT member, Ms. Stephanie Howell. The element she chose was the photo. She found the printing of your photo directly onto textured cardstock to be rather intriguing. So she did just that. 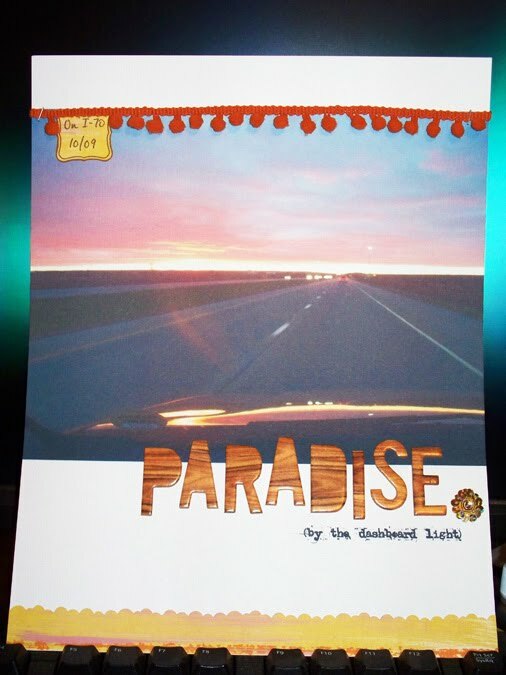 She played around with the idea, settling on a larger photo, just like Stephanie's, added minimal embellishments, and let the photo do the talking. She said that this lift forced her to think outside the box, and she ended up with a gorgeous layout. Is Stephanie the first person to ever print a photo directly onto cardstock? No, but what Steph did sparked an idea in Kelly's head, so by giving Stephanie credit for that particular inspiration, she's made Steph's day. Being scraplifted is a huge compliment. Jen from Down Under played right into my hands for the next example. 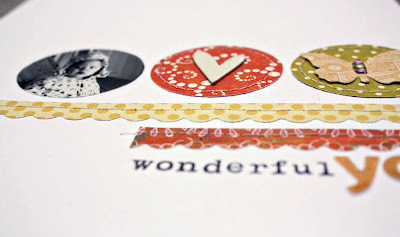 She'd commented on this layout I'd done for NSD, saying, "Oh I LOVE this Emily! I think I saw it over at the Crate Paper blog? I fell head over heels when I saw it and now I must lift it ;) love, love, love!" How could I resist asking her to do just that? So gentle readers, Jen's lift is an example of DESIGN lifting. Note how she kept the design quite similar, three photos in a row, title to the lower left of the row. 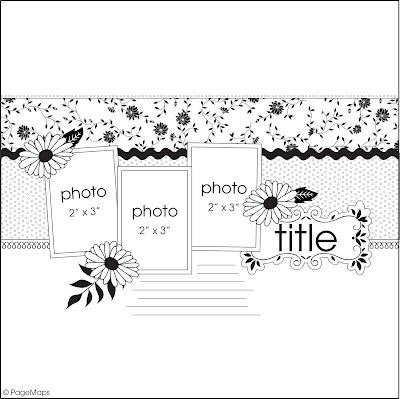 She however made it very much her own by changing up the floral element a bit, adding tabs, journaling down the right side of the photos, a tag as the base of her title, and some fun swirls of baker's twine, to name just a few of her adaptations. 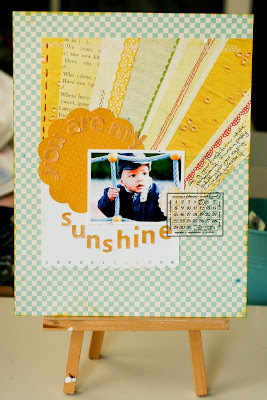 There was something in my original layout that appealed to Jen, but she made it very much her own, and when posting this layout to any gallery, giving credit for the inspiration would something like this, "I was inspired by Emily's layout, which was based off a sketch by Becky Fleck, who created her sketch for the Scrapbook and Cards Today NSD challenge." Yes, dear readers, it can be a bit tricky giving credit where credit is due, but it makes those credited so very grateful. My final example comes from France, where Francine (scrappyfran) was asked to pick a layout that inspired her color selections. I am fully aware, kind friends, that this is not the first time blue and yellow have been paired together. HOWEVER, if you see a layout that has a rather elegant pairing of colors and that inspires you to create your own, please, share the inspiration piece as a courtesy. 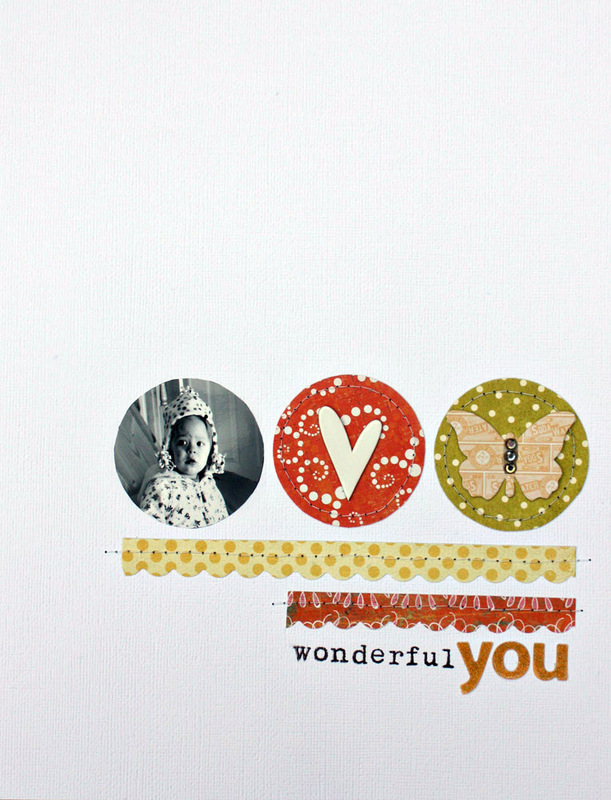 Francine's inspiration comes from this lovely layout by ania-maria. Francine picked this particular color scheme because she said it reminded her of Spring and Summer and just made her feel happy. She notes that she normally doesn't use the blue/yellow combination, but the color combination works smashingly well in both layouts. Since doing this lift, Francine has decided that she'll try using color schemes that she wouldn't normally gravitate toward. And she also found out that she enjoyed matching the color scheme of the photo, something that she normally doesn't do. In the end, the two layouts look nothing alike, but it would be proper for Francine to acknowledge the color inspiration. In general, I don't like doing lifts. I feel like I'm cheating, which I know is ridiculous! But as I was working on this page I was subconsciously thinking of other layouts I have in mind which would work great with this design! When I'm doing a layout I feel like so much of my time is wasted on trying to come up with a design I'm happy with, it's really the hardest part of scrapping for me. Lifting really is a time saver, giving me more time for more layouts! So scraplift away, and please, cite your sources! Fab post! Really enjoyed reading it. I love to see where people get their inspiration from, whatever they've created and however they've been inspired. It really adds to my understanding of their piece of work. A good (thought provoking) blog entry but i think the "giving credit" to a layout that inspired you is a little stretched--especially if if just got "your juices flowing." Now, certainly if a page is a direct lift one should give appropriate credit. But, if I see a monochromatic page in hues of red and I create a monochromatic page in green -- should i give credit. I don't think so. Furthermore there are some sketches that are simply recycled time and time again. I think the line is hazy and could/should try not to "plagiarize" another's artistic work. But there are limits. I appreciate the effort and the tone of the blog entry. Question for you. If I am inspired by a layout in a public gallery like Studio Calico's for instance, is it all right to link to it in a post on my blog about my layout that I created as a lift, without asking permission as long as I give credit to the creator by name. Or do I always need to ask permission before posting links? Is it any different for layouts done by design team members? Thanks in advance for your help. This is a wonderful (and important) post. And thanks AllieH! lucky for us, there are no scraplifting police and therefore not scraplifting rules per se. i know i've probably stepped on the line before, but i really try to pony up to the suggestions listed here. in response to S: one of the best parts of scrapbooking in my opinion is the public galleries. we all put our work out there to share with others, and hopefully to inspire! in my opinion, i think it's totally fine to link on your blog, just like we did in this post today, linking to the inspiration piece. but i would also encourage a quick email to the creator of the inspiration saying, "hey, i loved your layout, it inspired me to create this..." i think that applies to any scrapper who has inspired you. i am speaking for myself when i say this, but i think it's true that we all like to know something we've done has inspired someone! Great post. When I finally clear some space and create, it is usually because I saw something else---a photo or layout or color scheme---that speaks to me and won't be ignored. I'm very grateful for lifting as well as inspiration (2 different things). At the same time, people should be aware of how much we soak in what we see and might not even be aware of where what we create comes from---or how fluid/contagious ideas are. I fully expected Francine's layout to have been inspired by Susan W's layout from Quilting Bee (which I remembered because I know I plan to lift it). I think they share more in common than the one Francine chose to lift from, but she may never have even seen it. This is such an interesting post. Loved reading it and it really made me think. Thanks Emily! Well said!! I always try to credit those I lift and will continue doing so even more exact! TFS! oh my gosh. you don't know. (ok maybe you do) how much i needed this. i'm new to scrapbooking and it's hard for me to come up with ideas because i'm not a natural at this i just enjoy it. i feel like i would be cheating if i lifted but not anymore. i feel liberated haha. thank you for this. Emily, this was a great post... It's funny because I have been lifting layouts this year because of lack of time to creatively put something together but I feel guilty posting it on my blog because I forget who I lifted it from so I simply say it was lifted from kit club site but I don't give full credit to that person. I will definitely try Tumblr. Since I've lifted I've done over twice as much scrapbooking since the entire last year. If it works, it works.. Thanks for the great post.